It wasn't part of his plan to direct on Broadway, but after six seasons as Artistic Director of the oldest and one of the largest regional theaters in America, Bill Rauch was the acclaimed director of a Tony Award®-winning hit. Unlike many regional Artistic Directors who reach the Rialto, Oregon Shakespeare Festival's Rauch didn't take administrative leave to freelance in New York. He wasn't riding an ill-fitting vehicle out of subscription-subsidized, non-profit security and into heady commercial waters. The play, Robert Schenkkan's All The Way, had solid artistic pedigree. It was one of the first six scripts to emerge from "American Revolutions," an ambitious, audacious, decade-long commissioning program launched shortly after Rauch took the OSF reins in 2008. Before that, Rauch had been the Artistic Director of the Cornerstone Theatre Company, which he co-founded in Los Angeles with Alison Carey and Amy Brenneman in 1986. He and Carey, who joined him in Ashland as Program Director for American Revolutions, would oversee awarding 37 play commissions. That number, the same as plays in the Shakespeare canon, signaled their desire to make a significant and lasting contribution to theater. "Part of what we wanted to do with the canon of American Revolutions plays," Rauch said by phone a few weeks before the Tony Awards, "was to tell stories on a big canvas, and contribute not just to the professional body of plays that are produced, but to the amateur canon – the plays that high schools and colleges will be doing years down the line." The commissions, to veteran and emerging writers, came with a minimum of guidelines and a large helping of respect. "We believe in you: We believe in your voice," was Rauch's simple message. "If you're interested in the idea of moments of change in United States history, you figure out what you'd like to write about." As of our conversation in May, 21 of the 37 commissions had been handed out and six had been produced or were scheduled. See full list on OSF site. In addition to All The Way, the most familiar in Southern California is Culture Clash's American Night: The Ballad of Juan José, which premiered in 2010, was then staged at American Repertory Theater, and arrived here in a co-production by La Jolla Playhouse [where Theatertimes reviewed it] and the Kirk Douglas Theatre beginning in February 2012. Others include Ghost Light by Jonathan Moscone and Tony Taccone in 2011; Frank Galatti's adaptation of an E.L. Doctorow's The March, produced by Steppenwolf in 2012; Party People by UNIVERSES – Steven Sapp, Mildred Ruiz Sapp and William Ruiz, a.k.a. Ninja, also in 2012; and The Liquid Plain by Naomi Wallace last year. This season's The Great Society, by Schenkkan, is a sequel to All The Way, but not commissioned through "American Revolutions." "It was commissioned by Seattle Rep," explained Rauch, who again directs. "We want to keep spreading the wealth, but it was heavily developed by OSF. So we certainly consider it part of American Revolutions, but it doesn't count as one of the 37. It's like 37B. We're premiering it here in Ashland [INFO] and then Seattle Rep will produce both plays – All the Way and The Great Society – for the first time ever in rep this November and December, with mostly the OSF cast supplemented by some of Seattle's great actors. 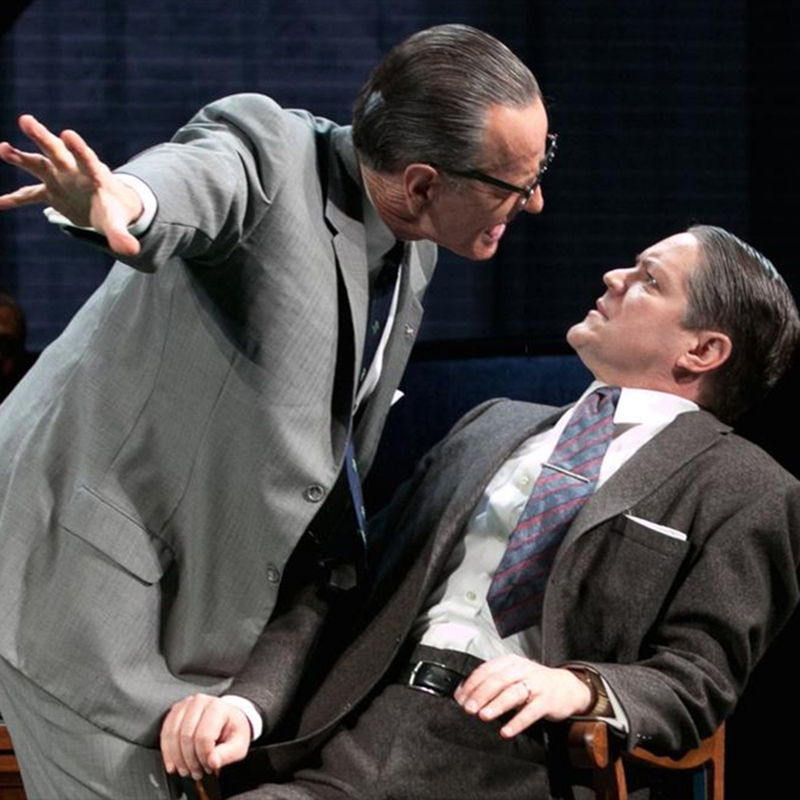 Anytime a production makes the leap to Broadway, casting changes occur and in the case of All The Way, the opportunity arose for Bryan Cranston to join the cast as LBJ. Though his credentials have been eclipsed by two high-visibility televisions series – "Malcolm in the Middle" and "Breaking Bad" – Cranston is an exceptional stage actor. "Bryan is a hardworking actor who respects the stage," confirmed All The Way cast member Susannah Schulman Rogers, who joined the show in Cambridge. "He's an awesome guy: laid back, generous, and nice as can be. The best you would want in a celebrity." I was convinced back in 2006, when the Geffen staged Sam Shepard's God of Hell [review], out of which Cranston's demented character rose with consistent clarity otherwise lacking throughout the production. With "Breaking Bad" the most discussed show in years, Cranston's appeal is impossible to separate from the play's box office success. Still, as insiders who saw both Cranston and originator Jack Willis are quick to point out, the play is an achievement on its own merits. "I like All The Way," Manhattan Theatre Club's Jerry Patch told me. "I saw it in Ashland, then in Boston, and then in NYC, and chatted with Bill about it each time. It breaks some new ground, and it works. Cranston is wonderful, and Jack Willis at Ashland was equally fine – so it's a good part. What I like about it most is that it opens a door for the kind of history plays about kings Shakespeare wrote that can be pulled from American history. Other than Lincoln, we haven’t done much of that in plays of size and with social/moral/historical implications." For Rauch, he sees it as an institutional success, flowing back to the commissioning, the company, the community, and the legacy of which he is currently principle custodian. "It's really helpful," he told me. "Absolutely. And I certainly don't think every play we do at the Oregon Shakespeare Festival belongs on Broadway, or that that's the ultimate aspiration for anything we do, but it's one exciting way to share a play with the larger world. And the fact that it's a 20-actor history play, straight play, not a musical, that has found success on Broadway, is exciting. "One of our hopes – dreams – was that the pieces we were developing and premiering would go on and have a longer life elsewhere. To have a play be successful on Broadway increases the likelihood that it will be done a lot more." Read the updated interview in "Theatertimes Intermissions: 15 Minutes with Bill Rauch."